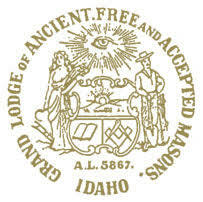 Well, today concluded with the 151st Annual Communication of the Grand Lodge of Ancient Free & Accepted Masons of Idaho in Lewiston, ID. I arrived Wednesday and attended the Grand Master's Private Banquet where I represented the Grand Chapter of Royal Arch Masons of Idaho. Thursday started with the public opening and then proceeded with the tiled/closed meeting. Thursday night included the annual meeting of the Idaho Lodge of Research where I was re-elected as Secretary. Friday night brought the Grand Lodge's Membership Banquet where District Mason and Idaho Mason of the Year awards were handed out to those worthy Brothers selected. The Grand Orator also gave his final speech before the Grand Lodge and guests.